More imposing than its ancestor — 42 mm in diameter compared to 39 in the 1960s — with a 12-hour graduated bezel and a new Heuer-02 calibre proprietary chronograph movement, the latest generation Autavia carries the DNA and aesthetic codes of the original, updated for today’s market. Its functions are tailored to modern requirements: a self-winding calibre, power reserve of 80 hours, date at 6 o’clock, water resistance to 100 metres. In black aluminium, the bidirectional notched bezel encircles a black dial with three white snailed counters in an optimal layout. A legible, balanced display with hands and applique indexes in steel coated with beige Super-LumiNova®. 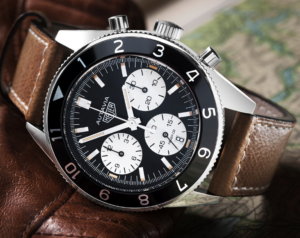 I’m really excited about this reissue, but I’m also really excited about the attention it brings to the Tag Heuer brand in such a way as newcomers to the watch can learn about the storied history of Tag Heuer. We have so many people here in New York City that are passionate about watches – many start wearing and collecting them for the fashion, but they stay for the history and passion. Many others inherit them from their fathers or mothers, and in that way a passion for watches is handed down across the generations. And many others are part of an iconoclastic trend to buck the cheap digital watches of the present day, and to set themselves apart by wearing a device that is part passion, part technology, and part tradition. I highly recommend you visit the Tag Heuer website and read up about this old watch, made new again.